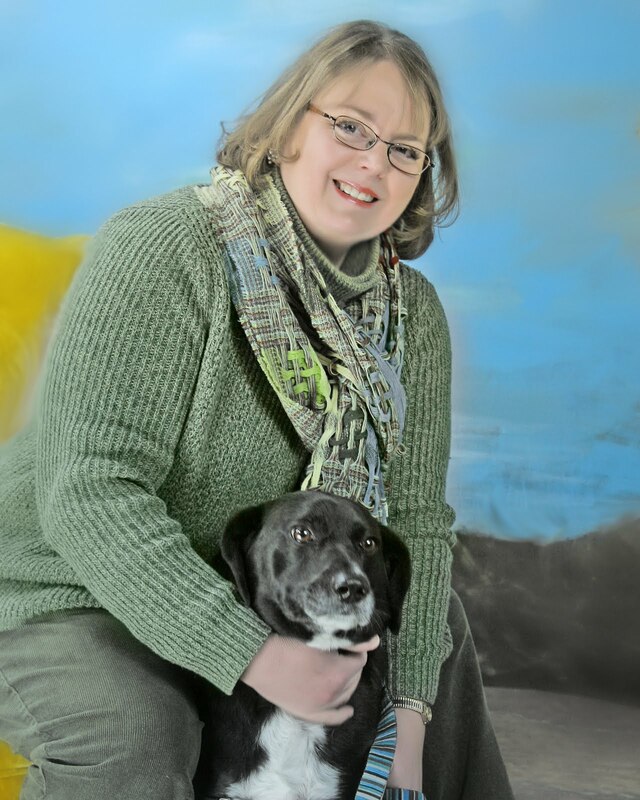 This is a photo I had taken of me, Nancy Jensen, with my dog Gordy when my editor told me I needed some new press photos in preparation for the publication of my novel The Sisters. I hate to be photographed, so I took Gordy with me to help keep me relaxed during the shoot. 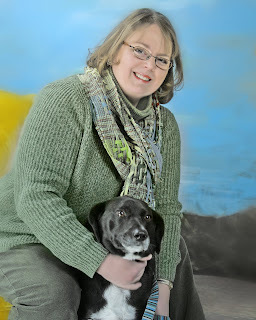 I also took the chance to ask the photographer to take a photograph of me and Gordy together, as I’ve found it very difficult to get my wiggly dog to sit still for any photo at all. Whenever I try to snap a shot of him, he dances around, obviously waiting for me to toss the camera across the yard for him. Gordy is five years old, a Heinz 57 stray. When he first turned up, everyone assumed he was Black Labrador mix, but I had a DNA analysis done, and it turns out he’s about 40% Beagle, followed by lesser percentages of Afghan hound, Rottweiler, Weimaraner, and several other breeds. Here [photo left], Gordy is enjoying a break with his beloved surrogate grandma, Mia Culling, who is also the brilliant trainer who had, luckily for me, just moved to the rural area where I was living when 6-week old Gordy turned up at my house frozen and starving in February 2007. This is Mia’s kitchen, one Gordy’s happiest places on earth. Today, we’re actually having tea—nothing fancy. I have some, too. But I’m taking the picture. Any treats for you or Gordy on this occasion? Indeed, yes! Grandma Mia had prepared some delicious sweet corn muffins, so Gordy could share in the snack! How were you and Gordy united? It was a frigid mid-February day, five inches of snow on the ground with more expected. The sun was just going down when I heard a piteous cry coming from the hill sloping down from my deck. I saw a tiny black smudge racing across the yard, so I ran out to my front porch and saw the smudge about to disappear over another hill beyond my neighbor’s house. Very quietly, so quietly I could barely hear it myself, I whispered, “Puppy?” The little smudge flipped around, came racing toward me, leapt into my arms, snuffled with relief and fell asleep. Suddenly I, confirmed cat lady, had a dog. How did Gordy get his name? Any aliases? Gordy’s real name is Gordian, as testament to the Gordian Knot—the classical knot so complex it can never be untied—around my heart. He became Gordy right away, because he was too cute for such a formal name. What role has Gordy played in your writing? Mostly Gordy flips at my arm with his nose when I’m trying to type. In the spring of 2010, when I was working to meet a deadline for revisions, he also helped by barking madly every time he heard the tiniest movement coming from the five men who were putting a new roof on my house. In The Sisters, my character Grace takes in all kinds of stray animals, and while I think she would have been this sort of person anyway, perhaps if it had not been for Gordy, Grace’s dog Charlemagne would not have found his way into the story. Please tell us about Gordy's work as a therapy dog. The amazing Mia, who trained Gordy (and trained me to train him) invited us to join her pet therapy group as soon as Gordy graduated from obedience training, when he was about 12 weeks old, so he has worked as a therapy dog nearly all his life. Our group visits nursing homes and adult day care centers, and the latter are the places Gordy likes most to visit. Many of these centers cater to adults with severe disabilities, providing the care they need during the day while their families work. Gordy has a particular gift for locating and befriending people who are agitated or uncommunicative. As soon as he nudges them, the nervous people start to calm and uncommunicative people—some who haven’t spoken in months or years—will begin to stroke Gordy and murmur to him. Pretty amazing. Does Gordy have a favorite place to go for an outing? Aside from visiting his grandma Mia, Gordy loves best to go to Historic Rugby in Rugby, Tennessee, where he likes to walk the trails and visit his many friends in the village. While in Rugby, he also expects to spend a couple hours as the shop dog for our friends who sell antiques and original artwork there. When we moved recently from the country to a side-walked neighborhood in a small city, Gordy discovered squirrels, and of course also discovered that he loves to chase them. He lives in the house with 8 cats, whom he is not permitted to chase, so chasing the squirrels gives him a lot of joy and makes him feel important. He has completely fallen in love with our mailman, who is equally besotted with Gordy, so they get to enjoy a five-minute play date several times a week. What is Gordy's best quality? He’s very loving and is always eager to make friends with new people—so long as he’s absolutely sure they mean me know harm, since he’s also an exceptional watchdog. If Gordy could change one thing about Kentuckians, what would it be? The absurd number of very loud pickup trucks and the supply of badly behaved dogs that so often ride around in the back of them. What is Gordy's proudest moment? Once when we were out walking, a strange dog came flying at us out of nowhere, barking and growling and threatening to attack. Gordy stayed calm, body blocked me to protect me, stood his ground and first gave a warning growl, then calming signals to the other dog. The other dog stopped, looked very puzzled, grunted in irritation and slunk away. If your dog could speak in the movie about your life, who should do his voice? Oh, that’s a hard one—but I guess I’d have to say it would be the young actor, Rico Rodriguez, who plays Manny on Modern Family because, like Manny, Gordy is enormously sweet, cheerful, and thrilled to be silly, but he’s also very serious about his dignity, and he’s smarter than any other dog in town. My Book, The Movie: The Sisters. The Page 69 Test: The Sisters. wow. gordy looks so much like my Riley. but my Riley could never be a therapy dog; so high-strung. What a cutie! Happy Wednesday!